That's a great question, and one that astronomers can't answer. Even the smartest scientists in the world don't know what dark matter is. But they know it's out there. How? All the planets, stars, galaxies and gas that can be seen today make up just 4 percent of the universe. The other 96 percent is made of stuff nobody can see, even with the most powerful telescopes. 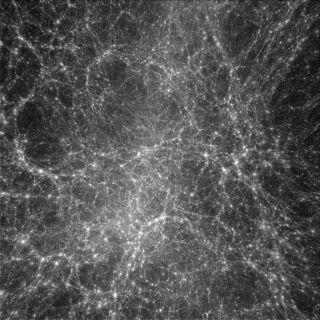 The strange stuff is actually two things: dark matter and dark energy. Astronomers know this stuff it out there because of the effects of gravity they can see on the objects that are observed. If that has you feeling stumped, don't feel bad. Here’s how one really smart guy, science writer Richard Panek, thinks of it: "The overwhelming majority of the universe is: who knows?"